Young artists between the ages of 10 and 18 can get a lot out of the Saturday workshop, Portrait Drawing Portfolio Development, where students are immersed in figure and portrait drawing. If you are preparing a portfolio for the Performing and Visual Arts Magnet entrance for Middle School or High School. Or perhaps preparing for college or an art institute, this intensive one-day workshop is for you! Kim Farcot, the instructor, also teaches at the Bates Middle School Performing and Visual Arts Magnet, so she knows what they're looking for. The class starts off with get-to-know-you games, stretching, and gesture drawings to warm up and then moves into studying the proportions of the body and head. After lunch, students get to draw from a live professional clothed model.The class takes place in the same studio where weekly life drawing and portrait painting groups meet and is equipped with easels, drawing horses, lighting and a model stage. The workshop is given on a Saturday from 9:30 am - 3:30 pm. Click here for a complete list of classes being offered this Winter/Spring. In November's workshop, there was an amazing group, who were engaged, focused, and very talented. They worked intently, even during breaks, and the final critique at the end of the day showed great promise by these up and coming artists! 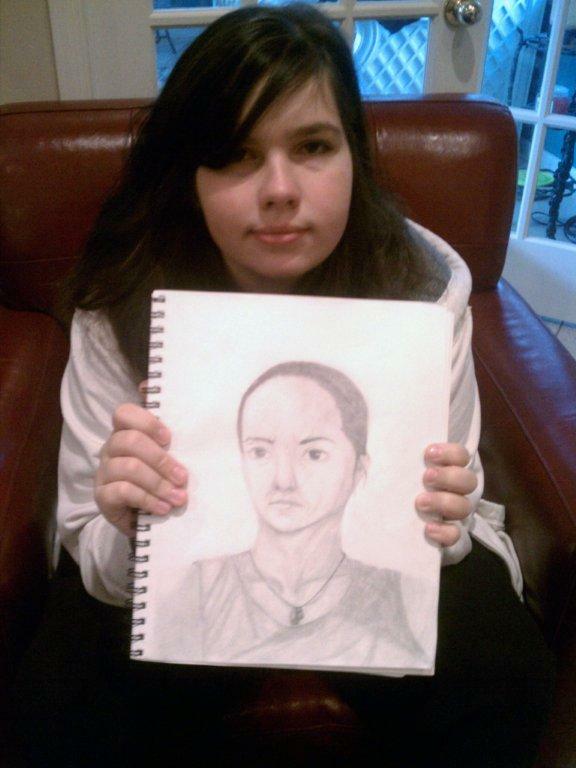 Student from the Portrait Drawing Portfolio Development workshop on November 3, 2012. Wednesday Morning Figure Co-op - The Drawing Co-op is open to artists who show sufficient artistic and technical development and are capable of working independently. For ages 18+. Long Pose Drawing & Painting Figure Co-Op - The Drawing and Painting long pose is open to artists who show sufficient artistic and technical development and are capable of working independently. For ages 18+. Portrait Co-op - The Portrait Co-op provides a variety of live models on a weekly basis. Each portrait subject sits for four consecutive sessions to enable the artists to complete comprehensive drawing/paintings in a risk free environment. For ages 18+. Figure Drawing Portfolio Development - Get a solid foundation in figure or life drawing to enhance your portfolio and prepare you for college. Students will create a series of charcoal or graphite life drawings starting with the basic form and proportions of the human figure, drawn from a live draped model. For ages 10-16. Portrait Drawing Portfolio Development - Get a solid foundation in portrait drawing to enhance your portfolio and prepare you for college. Students will create a series of charcoal or graphite drawings, starting with the basic form and proportions of the human head, drawn from a live model. For ages 10-16.